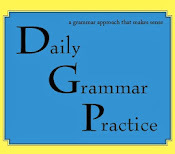 This week we will continue our series on strategies for helping students connect grammar and writing. This week's focus is passive voice. It's a long one, but passive voice is difficult for most students to grasp! Drop a pen on the floor. Set a book on the desk. Throw away a piece of paper. Next, ask for student volunteers. Give the first volunteer the first card. She should follow the directions on the card but not read the card out loud. Ask the class to create a sentence to describe the action that just took place. Students will probably say something like Courtney dropped her pen on the floor. Write that sentence on the board or overhead and ask students to rewrite it so that pen is the subject. If students suggest The pen fell on the floor, point out that fell doesn’t accurately describe the action. Students should then come up with a sentence such as The pen was dropped by Courtney. Ask students to make some observations about the two sentences. Most will say that the first one sounds better. They might also notice that the second one is longer. Explain that the second one is an example of passive voice because the subject is not active—it’s passively receiving the action. Bring up the second volunteer and lead students to generate another pair of sentences such as Kevin set the book on the desk. and The book was set on the desk by Kevin. This time ask students to establish a grammatical definition of passive voice by noting what the two passive examples have in common. Students should realize that a “to be” verb followed by a past participle creates passive voice. When students are creating sentences for the third scenario, instruct them to use present tense verbs: Sydney throws away the paper. and The paper is thrown away by Sydney. This step helps students see that passive voice does not mean past tense. Just because the sentence contains a past participle doesn’t mean that the whole verb phrase is past tense! After students create their fourth set of sentences, add the following sentence to the board: Matthew has sharpened the pencil. Many students will identify has sharpened as passive voice because of the helping verb has. Point out, however, that has is not a “to be” verb and therefore does not fulfill the grammatical definition that they have agreed upon. In addition, Matthew is active in the sentence. Finally, try The pencil has been sharpened by Matthew. Students should be able to correctly identify has been sharpened as passive voice. Be sure to explain to students that passive voice, although stylistically inferior to active voice, is not grammatically incorrect. Although writers should avoid it in most situations, there are times when it is acceptable—or even preferable. For example, I was born in Texas would sound pretty silly as My mother bore me in Texas! Sometimes we need to emphasize the recipient of action rather than the instigator: Most “how to” books are written by adults. And sometimes we really don’t know who is responsible for an action (or we know but don’t want to tell): The jewels were stolen during the night. Finally, have students look through their drafts of a current writing assignment and highlight all “to be” verbs. Then ask them to check each one to determine whether or not it is followed by a past participle. Once students identify passive voice in their assignments, they should rewrite those sentences. If they believe that a particular instance of passive voice is stylistically acceptable, they should be prepared to explain their reasoning. Invite a few students to share their before-and-after sentences. When students turn in their next final drafts, they should highlight any intentional passive voice verbs they used and write a note in the margin explaining why they chose passive over active. This type of annotation will show you without question which students understand and which ones still need more practice. Need a lesson for a specific area of writing? Leave your request as a comment, and we'll get right on it!